Bike rentals are available for all ages and abilities to enjoy all the diverse landscape of the island. The island is home to many trails for mountain biking at all ability levels. We can provide you with trail directions and advise on what terrain is most suitable. Our fat bikes are perfect for touring the expansive sandy flats at Reid State Park. Spend your weekends cruising dirt roads and having fun with family and friends. Featuring a lightweight aluminum frame and an SR Suntour suspension fork that can handle anything the road or trail dishes out. Plus, you get a 21-speed Shimano drivetrain that makes easy work of the climbs as well as the stopping power of disc brakes for total control on the way back down. You'll also love the easy-rolling aluminum wheels and the plush KHS saddle. Spend your weekends cruising dirt roads and having fun with family and friends. It features a lightweight aluminum frame and an SR Suntour suspension fork that can handle anything the road or trail dishes out. A 21-speed Shimano drivetrain that makes easy work of the climbs as well as the stopping power of disc brakes for total control on the way back down. You'll also love the easy-rolling aluminum wheels and the plush KHS ladies' saddle. A perfect cruising bike for town and on local bike paths. 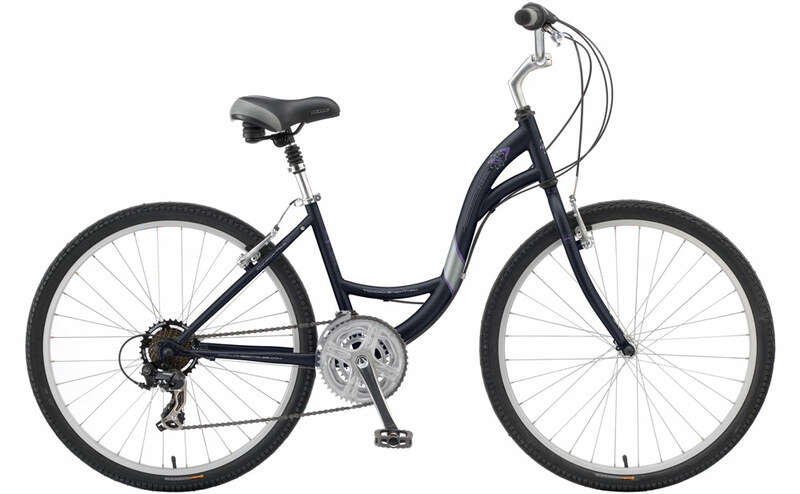 Its durable steel frame delivers a comfortable upright riding position. The soft saddle and suspension seat post smooth bumpy terrain, and the Shimano drivetrain has all the gears you need for easy pedaling.